It's been a very trying day . As I have posted on my Facebook page , my daughter-in-law's nephew was having open heart surgery today . He is no more than three days old and weighing in at 5 lbs . As I have stared at his picture I couldn't help , but be amazed at the strong features portrayed on his face . He is truly a beautiful handiwork from God . I have never seen a child that I didn't consider beautiful . My heart goes out to his grandparents , my Aubrey and especially for his mother . This is her first child and my heart aches for her pain , but I know that God is there with them . Everyday , my e-mail account receives a bombardment of subscriptions to various newsletters , articles and such . I'm always striving to improve my knowledge and what better way than keeping my mind open to what is out there . As I have made a commitment to living a healthy , spiritual and peaceful life , I'm constantly on the lookout for anything to enhance these qualities . Now , I haven't really tried any of these things and any feedback from all of you would be appreciated , but it is good to try new things for the betterment of our well being . Please let me know if any of this actually works . 1. Drink a glass of warm water with lemon every morning to help with digestion and cleansing . The surest way to keep from feeling left out is to let people in. hard . Our first instinct , is a desire to do the opposite . We want to withdraw into our private shells and lick our wounds in despair . Pity party anyone ? sad , or depressed ? Everything is always coming up roses in their life ? They can bounce back up to their feet instantly when things go wrong ? Believe me , I am the first person to admit that I don't care for the wallowing type , but . . . . . I do take a day or two in solitude to clear my mind and empty my heart . For a short work week , it's been simply exhausting and packed with errands . I've spent majority of the time either picking up supplies or delivery yarn for my crocheting ministry . The result ? Going to bed late and getting up even later , doesn't leave much time for anything else . Read on , my friends for a quick reminder of the One who loves us regardless of who we are . I never thought about being a mother . While my girlfriends were dreaming of getting married and having children , all I thought of was having a career . I became an Aunt at the age of sixteen and the girls were enough for me . I had huge plans for myself . I wanted a beautiful and large apartment of my own . I wanted a job in the career world where I could wear suits and move up the corporate ladder . These were the dreams I had in High School , not of changing diapers . 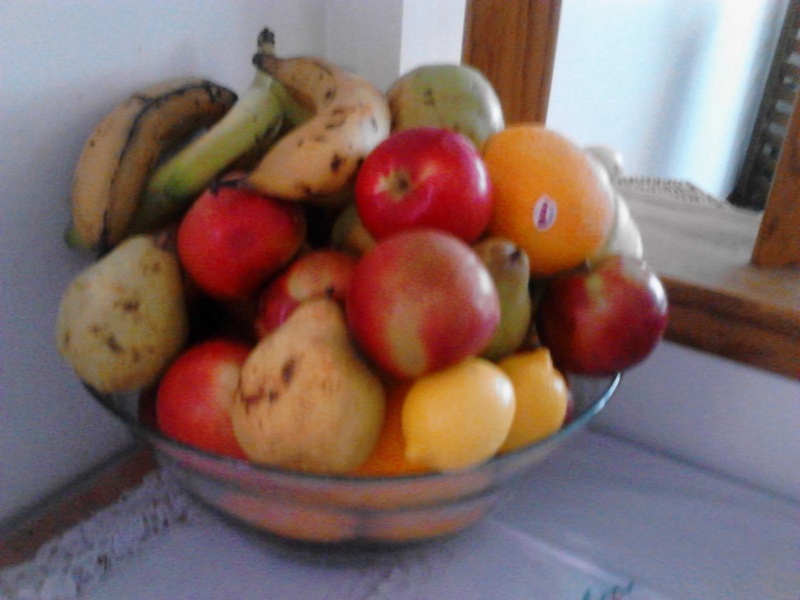 Our fruit bowl on the kitchen table . A year ago , I started a series called " Simply " , based on my desire to live out my life as close to healthy , stress free and spiritual as I could . For Emily and myself , living simply has become a way of life . Walking through the grocery store the other day , we noticed how much our life has changed regarding food alone . Majority of our shopping is done in a fruit / vegetable market and when we have to venture out elsewhere , we barely use all the aisles . Emily has taken this on with much gusto , embracing all things homemade versus preservatives in canned goods . As long as we have the basics ( flour , eggs , milk , sour cream ) we can make anything ourselves from scratch . We spend majority of our life searching for our purpose , a reason why we are here . Some of us find it right away and others take a lifetime . I , myself , have never given it much thought in the past . I met a man , set up house and raised a family figuring this was my calling . I wasn't happy , but I have made a choice and now had to deal with it . During that time , I had four children , three boys and a girl . Two of those boys died within three years of each other , one in crib death and the other spinal bifida . " We all have a cross to bear in life , this is your cross " , my grandmother said to me . Not too long after that , my family broke up and I took my two children and left . Becoming a single mom wasn't something that I planned on all those years ago when I chose the wrong man . How old was I then ? Not even thirty . Worship is God's invitation to us . Come as you are . I love worship time . To me , it's more than just singing away the time until the service message begins . It is a way to reconnect with God through praise and an opportunity to share with Him a private conversation of your thoughts and feelings . service . They miss out on the most important part of the whole experience . It really can be such an intimate time where one can forget the existence of everyone else in the room . Worship and Praise can happen anywhere . It doesn't have to be in Church . I personally love to blast my radio or CD on my way to work . What a tremendous stress release to set the tone for the work night . It prepares and clears my mind so I can be in tiptop shape to handle any situation thrown my way . When I was growing up , I watched my mom gulp down pots of coffee to keep her going from one job to the next . It was the 5-hour energy drink all rolled up into a small cup . It performed magic ! It was only natural that I follow suit . I loved coffee ! At that time , a cigarette and a cup set the tone for a perfect moment of relaxation . Most days , it served as breakfast and lunch , doubling as a great substitute for a diet . A travel mug was permanently attached to my hand . It was about two years before my cancer that I quit smoking and suddenly coffee didn't taste the same . I went through a period of unbelievable loss , anxiously researching different brands to achieve that similar taste I so missed to no avail . Coffee wasn't the same anymore . Life has certainly been good these past few weeks . It seems my cancer is taking a nap , hopefully a very long one . I shall be going to my new shift during the first week of February . My sabbatical from Sunday School begins by the end of this month offering some rest . Plus , it's a new year . Yes , it's been a great start and things are looking up around here . There is something to a new beginning , stirring up the blood flow like a fountain of youth . I believe , another name for it is HOPE . Life certainly is a valley of mountains that slope upwards and downwards . For every low , there will be a high sooner or later . I am almost positive that my cancer will return , but until then I plan on celebrating every high peak I can get . This past Sunday , I preached to the children the story of Daniel and the Lions Den . That story deals with faith and Daniel had an abundance of faith . As I prepared for the lesson , I was reminded of my own faith and why I come to Church . When I made the decision to get baptized , I embraced the commitment wholeheartedly . I had a deep desire to live my life a certain way . . . . God's way . commitment . I fallen down many times , but always picked myself up . Each time , I have looked in the mirror and tried to see the why behind that fall . To me , before I can make all the necessary changes , I need to see what brought about that need for change . Sometimes we just need to move on no matter how difficult the change or that adjustment may be . Life goes on as we outgrow things , people and situations in our life . It can be painful , hurting us to our core , but change is necessary for us to grow spiritually . We say we want a new beginning , but we don't want all the work that comes with it . It's just too much and really , we are not ready for it . Saying it and doing it are two separate things . I can see a pattern taking hold in my life for a need to better my relationships with God and with others . I want to take it to another level because I feel ready for it . It is time to let go of the old and get on with something new . But like with all things , change takes time and results take even longer . The waiting is always the hard part . In my early years as a Christian , I couldn't wait for Sunday to come , especially after a trying week . I wanted to bring it to the King and leave it with Him . I haven't felt like that in a long time . What happened for it to go missing ? Why have I allowed it to go on for so long ? It can happen so easily , filling your life with so many other things and placing your relationship with God in between the cracks . I've always been a lone wolf . Although , I have many friends , I don't expose the intimate side of myself . Very few of my friends ever really know me . What goes on the inside , stays on the inside , opting to show the clown instead . We all hide behind our masks , whatever those masks may be . Mine always has been the sarcastic , poking- fun -at -myself attitude mask that has represented a smiley face on the outside . Nothing deep there . . . or one would think . It is much easier and safer to keep people at a distance than to share oneself and allow them to hurt you . People have been hurting each other since Adam and Eve , why would it be different now ? alone . For that reason , I feel we put up with a lot of things that may not be right for us . We fear of being alone . 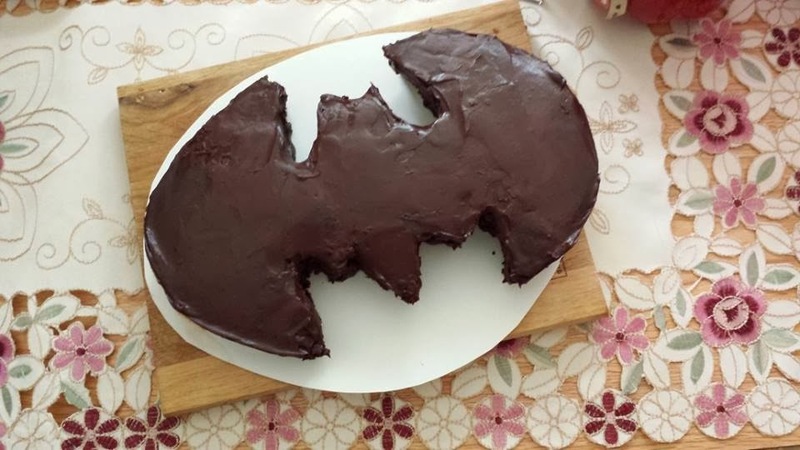 Going through some old files on my computer , I came across some pictures of cakes that Emily has made this past year . There were quite many different models that she worked on so hard . Cake decorating has never been her strong suit in Culinary School and she struggled greatly . It was during that time I was diagnosed with cancer and in the Hospital . She basically went through her struggle alone as all the focus was on me . She never finished nor received her degree as a Pastry Chef , but she never stopped trying to improve herself . During this past year she'd practice all on her own . Here are some of her creations . Life is a constant struggle . Do we surrender when faced with trials or difficulties ? Do we stop living and throw our hands in the air with defeat ? No , we make cake ! At the start of every New Year , there is so much talk of resolution and plans for what we are trying to achieve and we never complete them . Why not just throw those Lists out and strive for one thing ? How about if we become Christ's People and live according to His will in His image . Enjoy the Link everyone .
" do over " from last year ? Or is it the promise of Hope ? An opportunity for dreams to come to reality ? Just recently I made a decision to take a step back and evaluate what was missing from my soul . This feeling of disconnection from everyone and everything would not go away , instead kept getting louder . I knew I was slowly losing my spiritual self . I needed to take a break , but from where ? Since I view death differently now then when I was younger , I found the above tweet to be hilarious . Unfortunately , not many felt the same way . We see death as serious business . Death is ritualistic , full of pomp and has a sober air of reality . For some of us , death is an end , the final hoorah . For others , it's a fine line between heaven and hell and their salvation . Before cancer , death would scare me to pieces . The thought of worms eating my flesh while in the ground gave me shudders . If I chose to cremate myself , I hoped they would wait until I was fully dead . Silly , isn't it ? It is the fear of the unknown that scares people . As a Christian , I know where I am going as long as I follow Christ's principles . That knowledge offers me comfort and ease so I no longer view death as something horrible . It is merely a transition to our Promised Land with Christ . . . . . our reward . We all have things we look forward to in our lives . One of my favorites happens to be the January Fast at our Church . I love to start the New Year cleansed , feeling fresh within my soul . Our Church does 21 days , but Emily and I do the entire month . Why do we fast ? I believe we experience clarity and the fast heightens the intensity of whatever we are seeking . The question isn't why we are , but what we are fasting for ?